Navigational consultant, oracle reader, author, radio show host, teacher. Jim's expertise includes: Astrology, Tarot, Numerology, Mah Jongg, Druid animal totems, Rune Stones, Angel cards and Lakota Indian teachings. He teaches workshops on developing one's intuitive abilities for practical use in everyday life. 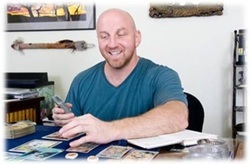 In personal one-on-one sessions his skills in using the wisdom of Oracles helps his clients to empower themselves by releasing fear and recognizing the choices and influences that contribute to the creation of their personal realities. His counseling and life work is grounded, perceptive, and often humorous. His instruction is clear, direct, and he uses a down-to-earth style to demonstrate how anyone can add enlightenment, and flow into their life path. Jim has twenty-seven years experience as a spiritual counselor in addition to being the host of Body Mind and Spirit of Arizona, a public access show that aired for two years. He was the creator and original editor of Practical Spirituality, a quarterly publication. He is currently the author of a monthly internet column called Snake Oil, host of Snake Oil radio, and frequently does guest appearances on the ABC show TheList. His first book, Dirty Little Secrets, is available on Audio DVD, (read by the author), and in print. His second book, Snake Oil Volume One is now available in print. Note: All appointments must be pre-booked. I don’t take walk-ins. This is my home and I do not (for many reasons) have a flickering psychic sign in my window lol! Same day appointment requests are rarely possible anymore, unless I have a cancellation, or you catch me on a light day (lately that has become uncommon as well). You are free to ask, but more likely it will be a few days to a week before I can get you in for a session. I schedule between 14-18 appointments a week and do not book more than 18 for any week. I like to be at my best for all of my clients, so I don’t overbook! 5. Increased awareness of life purpose and the challenges, talents and the unique abilities that are yours for this lifetime. $10-15 off listed rates for your first 45 minute session, 70, or 90 minute session! Ask for the special when you email Venturasag@yahoo.com to book. Debit and credit card payments get $10 off for 45-90 minute sessions. Local in-office clients can get an extra $5 off for cash or check payments for sessions. If you want to buy a new client a thoughtful gift of a session you can also take advantage of these rates! My current rates (new clients can subtract the above discounts from these rates): 45 minute sessions $85. 70 minute sessions $110. 90 minute sessions $130. Sessions can be in-office or by phone. Birthday Special (If you currently receive my monthly column and by invitation) you can take advantage of this special! Ask to be added to my monthly mailing list - include your birthdate - and you will receive an invitation around your Birthday for a similar special each a year. Birthday invitation discount is $20-40 off my listed rates!